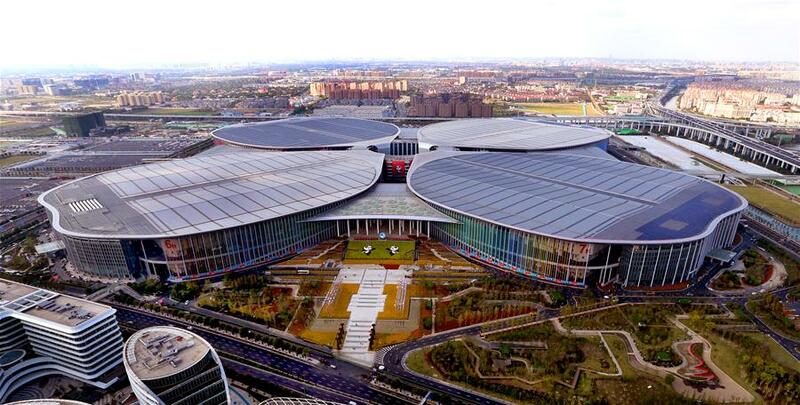 BEIJING, Oct. 22 (Xinhua) -- The first-ever China International Import Expo (CIIE), scheduled for Nov. 5-10 in Shanghai, will see the participation of over 130 countries and regions, and more than 2,800 companies. Here are some facts and figures about the event. China has been the world's second largest importer of goods for nine consecutive years, and made up 10.2 percent of global imports in 2017. It is one of the world's largest markets of high-end products such as industrial robots, chips and machine tools. The country announced import tariff cuts on 1,585 industrial products including machinery, spare parts and raw materials from Nov. 1, after removing tariffs from most imported medicine in May and reducing tariffs on autos and consumer products in July. The CIIE will see 160,000 buyers from over 80,000 domestic and foreign companies, exceeding the organizer's expectation of 15,000 companies. China has granted the status of "Guest of Honor" to 12 countries, namely, Brazil, Canada, Egypt, Germany, Hungary, Indonesia, Mexico, Pakistan, Russia, South Africa, Vietnam and the United Kingdom. More than 30 of the world's 44 least developed countries will participate in the event. The expo provides two standard booths free of charge for less developed countries. The CIIE will receive companies from all the G20 member states, as well as 50 countries and regions along the Belt and Road. Attending companies include more than 200 businesses on the Fortune Global 500 list, as well as a wide range of small and medium-sized companies such as fruit exporters in Southeast Asia and coffee makers in South America. The CIIE will receive U.S. chip giants Qualcomm and Intel, Japanese electronics heavyweight Sony and Panasonic, as well as consumer goods leaders Unilever and Lego. German manufacturer Waldrich Coburg will exhibit a 200-tonne milling machine, the largest item on display at the expo. Eight world-leading machine tool producers will participate, with more than 10 exhibits making a first appearance in China, Asia or even globally. Exhibitors are expected to launch more than 100 new products and technologies at the event. High-end and intelligent equipment will occupy one of the CIIE's biggest exhibition zones, covering 60,000 square meters. Around 300,000 visitors are expected to arrive in Shanghai during the expo. The municipality said it is geared up to accommodate visitors, and controlled room rates from Oct. 26 to Nov. 14. More than 5,000 volunteers are recruited for the CIIE, offering language services in English, Japanese, Russian, Arabic, Spanish, Portuguese and French. All volunteers are trained in language delivery, interpersonal communication, coping with stress and service protocol. With a population of around 24 million, the host city of Shanghai is China's industrial and commercial hub, and one of the country's earliest cities to build economic ties with foreign countries. Shanghai port has handled the most containers worldwide for seven consecutive years. In preparation for the expo, Shanghai has set up a specialized court and judicial team for handling civil and commercial cases concerning the expo, the conference and exhibition industry, the expo venue and commercial cases concerning foreign affairs. A special center to deal with disputes concerning intellectual property rights has also been set up. The municipal government has been renovating roads around the expo venue, and has developed cellphone applications to better guide traffic around the area. It added eight bus routes and prepared 100 spare buses for the event.